The Model 555 cloth drill has been specially designed so the textile & clothing industry can accurately mark multiple ply cloth lays with the minimum of effort. The machines features a spring loaded, smooth action, lever type handle for optimum straight line drilling. 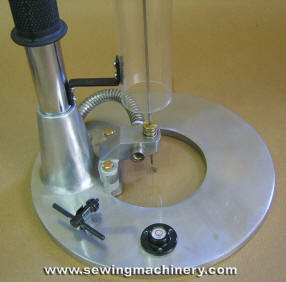 Added to this is an enlarged circular base plate, a sturdy column hand grip and a built in visual level gauge, which helps to ensure that your cloth is marked at the same position, ply after ply. The Model 555 cloth drill is not only limited to drilling materials such as denim, corduroy, canvas etc., because it comes fitted as standard with a thermostatically controlled heating element, it is able to drill/mark loosely woven material such as woollens, jersey, knitwear etc., which would normally tend to close up when a cold drill is used. Professional lever type drilling action.